Thousands of Yemenis have staged a mass rally in the capital Sanaa to protest against the Saudi bombing which recently entered its third year. They have also urged the Houthi rebel authorities to intensify the battle against the “5th column” and alleged Saudi spies. Demonstrating against the ongoing military campaign of the Saudi-led coalition which began in March 2015, the protesters marched to mobilize more tribal fighters to oppose the coalition-backed Yemeni government forces which control parts of the country. 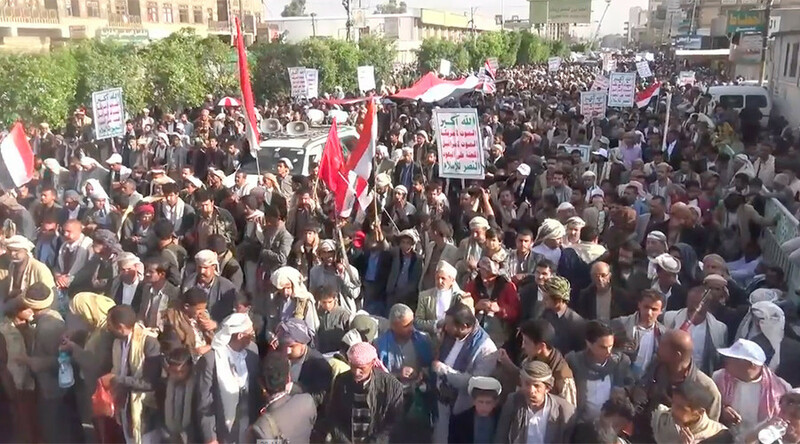 The crowd urged the Houthi government – the Supreme Political Council – to declare a state of emergency which will grant loyalists with more powers to implement internal security measures in areas under their control. The emergency powers will also enable the Houthis to hunt down alleged Yemeni supporters of the so-called “fifth column” of the Saudi-led military coalition. “We appeal to the political council and appeal to the government and the bishops to call for a state of emergency as soon as possible because we have been facing an unjust war of aggression for two years and we have now entered into the third year,” protester Amer al-Salmi, told RT’s Ruptly news agency. The demonstrators chanted slogans against those who they believe are Saudi-paid Yemeni traitors. “Men at the front of the army and the popular committees are facing aggression on foreign fronts. We also have a duty to confront those who work with this aggression from within,” said protester, Ibrahim Hamiduddin. The massive event proceeded along the Airport Road. A number of key speakers urged unity and called for the creation of an internal front to face the Saudi war machine and the alleged traitors whom they accuse of working for the Saudi monarchy. “The people of Yemen are fully prepared to confront aggression no matter what its size, whatever its potential. The Yemeni people depend on God Almighty and rely on God and depend on the self-development that develops day after day, one period after another,” Daifallah al-Shami, a member of the Political Council of Ansar Allah said. The Yemeni Civil War began in 2015 between two factions now claiming to constitute the Yemeni government. The Houthi forces now control part of the country including the capital Sanaa and are allied with forces loyal to the former president Ali Abdullah Saleh. On the ground, they now fight the forces loyal to the government of Abdrabbuh Mansur Hadi, based in Aden. Hadi, who fled the country in 2015, has mainly relied on Saudi air power to fight the Houthis. 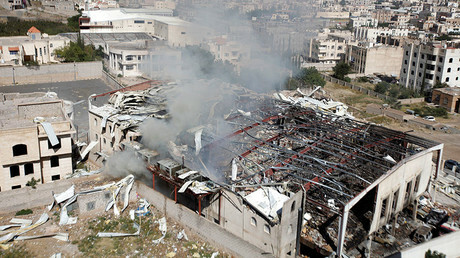 In over two years of relentless Saudi-led bombardment, more than 10,200 people have been killed. 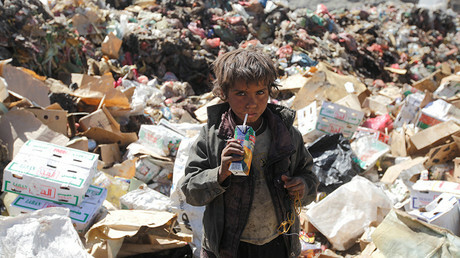 At least another 40,000 people have been wounded while more than three million Yemenis have been displaced. As the fighting rages on, the US and the UK have been sharply criticized for their role in arming and supporting the Saudi-led coalition amid growing evidence of war crimes, mounting civilian casualties, and pressure from human rights groups.